Online Course Launch: What Is Depression? Announcing a new PsychologySalon online course: What is Depression? This course is designed for the general public, though mental health professionals may also find it useful. The emphasis is on the diagnosis and the experience of depression and related mood disorders. The causes of depression are not covered, nor are treatment strategies (though there are hints and recommendations throughout). Future courses will emphasize risk factors and treatment strategies more thoroughly. Why talk so much about diagnosis? One of the central problems in mental health has been the shifting line dividing what we think of as normal-range distress from the territory labeled clinical disorder. Life is difficult. We will all experience declines in mood and, yes, functioning at times in our lives. Mood has become medicalized, however, and it is difficult to experience these periods without wondering whether we are clinically depressed. In fact, the majority of people referred to Changeways Clinic for mood disorders do not meet diagnostic criteria for any clinical disorder and, as far as we can tell by retrospective interview, never have. Perhaps by learning about the actual definitions of the various mood disorders, many people will be able to reassure themselves that they are distressed, but well. If you are not clinically depressed, does treatment work? That depends on the treatment. Many of the lifestyle-based approaches that therapists advocate have been researched on both clinical and subclinical groups, and seem helpful for both. Exercise, watching your diet, managing your sleep, boosting social contact, and developing an awareness of distortions in thinking – all of these seem helpful whether one is clinically depressed or not. Most medical treatments have only been researched with people who meet full diagnostic criteria – and there are indications that the milder the symptoms a person has, the less distinguishable medications are from the effects of placebo. Yet the majority of individuals prescribed antidepressant medication in Canada probably do not match the description even of mild major depressive disorder. They are part of a group on which such medications have never really been tested and appear likely to be ineffective. So it can help to realize what depression really is – and to learn about some of the controversies in the field. Lecture 1: Depression versus The Blues. Depression is both a diagnosable condition and a word in common usage. Where is the dividing line – and is depression qualitatively different from what most people experience? Lecture 2: The Floating Diamond Model. Often called a “mood disorder,” implying that depression affects primarily the emotions, depression actually changes a person’s physical functioning, behaviour, and thought processes as well. Lecture 3: Major Depressive Episode – Mood-Related Criteria. The diagnostic criteria for major depression are divided into two sets. This lecture considers the two primary mood criteria: sadness and anhedonia. Lecture 4: Major Depressive Episode – Other Diagnostic Criteria. A consideration of the remaining seven symptoms used in diagnosing major depression. Lecture 5: Major Depressive Disorder. The diagnosis of Major Depressive Disorder depends on the person having had at least one Major Depressive Episode – and meeting a few other rules besides. Plus, we talk about a controversy – can a person with recent bereavement be diagnosed as depressed? Lecture 6: Additional Symptoms of Depression. The diagnostic list does not cover all aspects of the depressive experience. Here we go back to the Floating Diamond and cover more symptoms people often experience. Lecture 7: Snowballs and Reverberations. Whether a person is experiencing full depression or only the blues, the symptoms can feed back and make the problem worse – often by making positive action seem less appealing and inactivity more tempting. Lecture 8: So is there Minor Depression? If clinical depression is called Major Depression, what would Minor Depression be? Is it a real disorder? Here we consider the risks of pathologizing normality – even distressing normality. Lecture 9: Dysthymia (Persistent Depressive Disorder) What if subclinical depression goes on and on and on? Eventually we might consider it a disorder. A major challenge with dysthymia is that it promotes a lifestyle and pattern of thinking that perpetuate the problem. Lecture 10: Bipolar Disorder Mood can go problematically “high” as well as low. Here we consider the diagostic criteria for mania, hypomania, and the bipolar disorders. Lecture 11: The Epidemiology of Depression. Who gets depression? How common is it? What does it cost the culture? Is it becoming more common with time? Lecture 12: Course Wrapup. This isn’t a treatment or self-care course, but in this final lecture we provide some basic recommendations for self-care. We have more courses in the works and hope to launch them shortly. First up: A course for physicians and mental health professionals on the diagnosis of mood disorders. Stay tuned! Alain de Botton, founder of London’s School of Life (www.theschooloflife.com), is one of my favourite authors. His specialty is best summed up as “practical philosophy”, and his books could easily form a multi-year syllabus at the philosophical café nights that are currently popular. His books range from the usefulness of Proust (How Proust Can Change Your Life), to the effects of urban and dwelling design on emotion (The Architecture of Happiness), to the unintended effects of a culture based on equality (Status Anxiety). In each book, de Botton pushes beyond the obvious to examine issues of the everyday in a serious and insightful way. Religion for Atheists (2012) asks whether the trappings of faith might offer significant psychological benefits - apart from the possibility of “getting the right answer” and securing an advantageous position in the afterlife (if any). In this book he takes it as a given that the various deities are of human construction, and that if there are hidden influences beyond the natural world, they probably do not resemble our visions of them. This may be an annoyance to the religious, but I would advocate sticking with the book anyway. De Botton dismisses virgin birth, resurrection, salvation, and all the rest with breathtaking speed not, it turns out, from scorn but simply because he is hurrying toward a series of observations that form his real topic. He has none of the impatient superiority that crop up so frequently in writings on atheism by Christopher Hitchens, Richard Dawkins, and others (I’ve read and enjoyed some of these books, but the sneering is always a barrier). I suspect most of us have at one point or another considered or talked about whether religion has any usefulness if it turns out not to be based on an accurate understanding of the universe. It gives people a place to go, it provides an instant social network, it encourages thinking outside one’s own self-interest… and soon the conversation dries up, the topic apparently exhausted. De Botton’s analysis is admirably wide-ranging. He talks about his passions of architecture and art, pointing out that religions have always appreciated the impact of buildings on psychological states, whereas the secular world has given us Stalinist tower blocks, faceless cities, and alienating housing. Stripped of the requirement to send a theological message, much modern construction is more a testament to the designer’s ego, the developer’s budget, or the desire to impress with ultimately unappealing stunt architecture. Rust Belt Chic: Medium-Security Prison, or Inexplicably Hard-to-Sell Vancouver Condo Block? He argues that religion has always had a deep appreciation of the use of multiple media in communicating its message. Theology finds its expression not just in dry books or sermons, but also in ritual, in the design of buildings, in music, and in art. By contrast, secular culture tries – and often fails – to get by with text alone. And for emphasis, he draws aim on the field of psychotherapy, fires, and scores a direct hit. He goes on, but you get the idea. He is not an ardent anti-therapy activist, in case you wonder – the School of Life offers psychotherapy as one of its many activities. Psychotherapists have sometimes been described as the priests of the secular age. If so, de Botton argues, we aren’t doing a very good job at it. I’d have to agree. 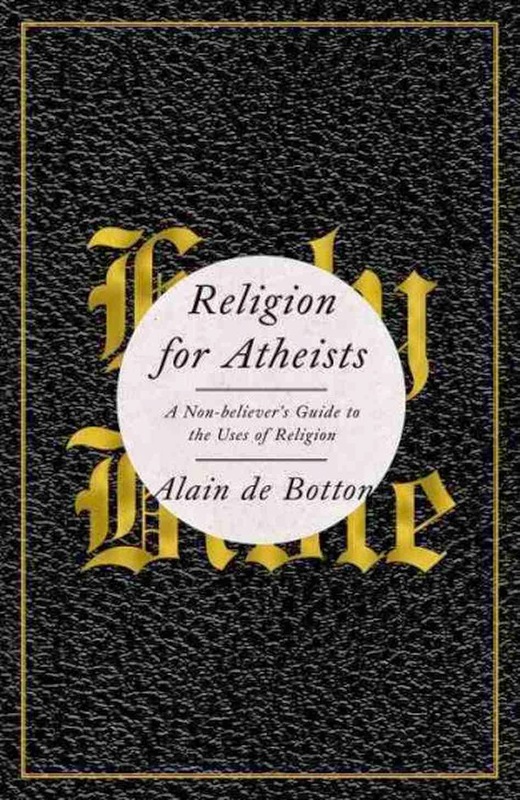 De Botton’s book is an obvious choice for thoughtful atheists – at least those not consumed by rage or contemptuous superiority over the topic of religion. But as I was reading it struck me that his appreciation of the role of religion in psychological life is so thoughtful and ultimately respectful that believers might get even more out of reading it. A shame that the title will likely put them off.